Reggae/Pop star Da’Ville alongside Golden Krust and Newark Liberty International Airport kicks off the 50th Anniversary of Jamaica-Trinidad Independence with Krazy Love during their week long customer appreciation celebration. The celebration begins on Friday August 3rd from 11am – 2pm at Golden Krust’s Juice Bar located in terminal A at the Newark International Airport with a free concert performance by reggae crooner Da'Ville; well known for his classical hit “On My Mind”. 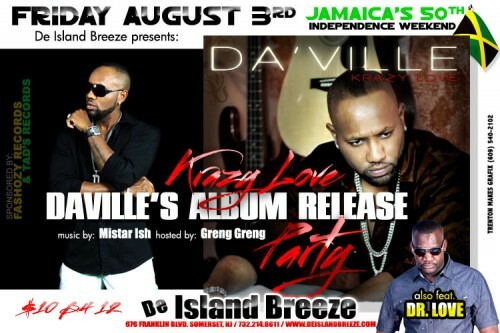 Da’Ville will perform hits from his recently released album entitled “Krazy Love”, which will be available for purchase. Da’Ville will also be available for photos and autograph signings. Golden Krust will offer several customer benefits during this occasion primarily through their juice bar located in Terminal A at Newark Liberty International Airport. Customers can sample and purchase all natural juices and ice-cream. All airport employees will receive a 50% discount off their juice bar purchases between 11am – 2pm. The celebration will continue at Golden Krust Restaurant’s Lyons Avenue Newark NJ branch with a Family Fun Day on Sunday August 5th. All Media representatives are cordially invited to attend the following events. For more information about the events please call 513.257.7435 or email events at avalanchesoundja@gmail.com or dm @avalanchesound on twitter.